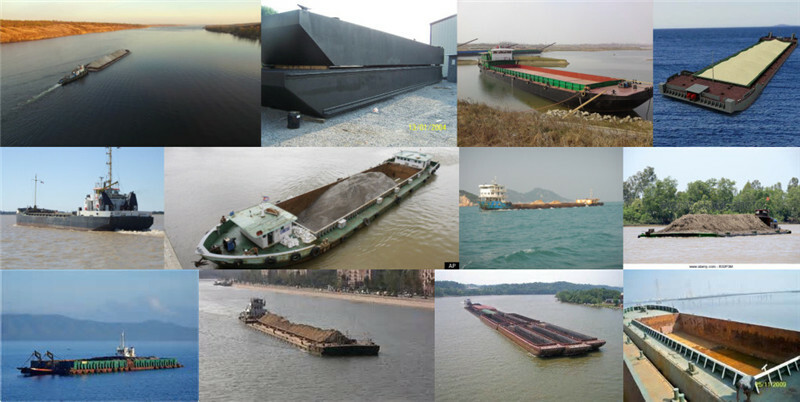 Product categories of Sand Barge, we are specialized manufacturers from China, Transport Sand Barge, Floating Crane Barge suppliers/factory, wholesale high-quality products of Deck Barge R & D and manufacturing, we have the perfect after-sales service and technical support. Look forward to your cooperation! Two is a superior performance in offshore navigation. How many ship mast sail can sail upwind, can sail in the ocean. Sand mast tall, high mast sail high, for the wind, and it has a shallow draft, low resistance, so fast sea voyage. Sand can sail with the wind, the wind can also sail upwind, even top water can sail, good seaworthiness. Ship navigation performance, seven wind sail smoothly, while the waves, so the sand can sail. Three is a heavy load. General recorded that sand load is four thousand to six thousand stone stone (about five hundred to eight hundred tons). Also said that the sand carrying capacity is 2000 stone to 3000 stone (about 250 tons to 400 tons), the Yuan Dynasty ocean ship 9000 stone (1200 tons and above). 1, the shortcomings of sand is affected by water area. Due to the bow for the tablet, slower. Therefore, on both sides of the boat in the middle of the added water board [waist camel], on both sides of the bow adding Mizuki stems, in the stern of the hanging basket of peace [in case of large waves fashion rocks the boat], greatly enhances the stability. Especially after installed flashings, ability makes the wind sail already have driving is enhanced. This ship can still drive safely in the case of wind seven. 2, sand waves ability, inland water transport has a large transport capacity, can adapt to the characteristics of river shore shoal. But it reflects great weakness in offshore Hainan airlines. During the Yuan Dynasty, the government from the Yangtze River mobilized consisting of more than 900 boats Barge fleet against the Japanese, in western Japan Sea typhoon after almost annihilated. Since then, the Japanese call typhoon "kamikaze", is from here. Therefore, it is generally used in inland waterway transport and in the special seasons for the use of transport supply ships. Because of the sand has the characteristics, so it in inland civil transport use is very extensive, along the coast have traces of sand. During the western Zheng He, Zheng He of the fleet of treasure ships have sand ship. At the same time, Zheng He's treasure ship is in the area of Nanjing treasure shipyard, built there is mostly sand ship ship. Sand in China lasted for a long time in history, Emperor Daoguang's reign of the Qing Dynasty, Shanghai has sand 5000 ships, it is estimated that when the sand in the total number of more than million vessels. Sand occupies an important position in the history of China shipping.